IT - Supportive or Core? Just Automate That … Design & Mindset Modularity Complexity Independence Maintainability Good enough? Just Automate That … Test Data How to generate? Ownership Sampling Stale data? Sensitive Design & Mindset Modularity Complexity Independence Maintainability Good enough? The Risk Reduction - Release Dilemma Business IT Ehh… sure. 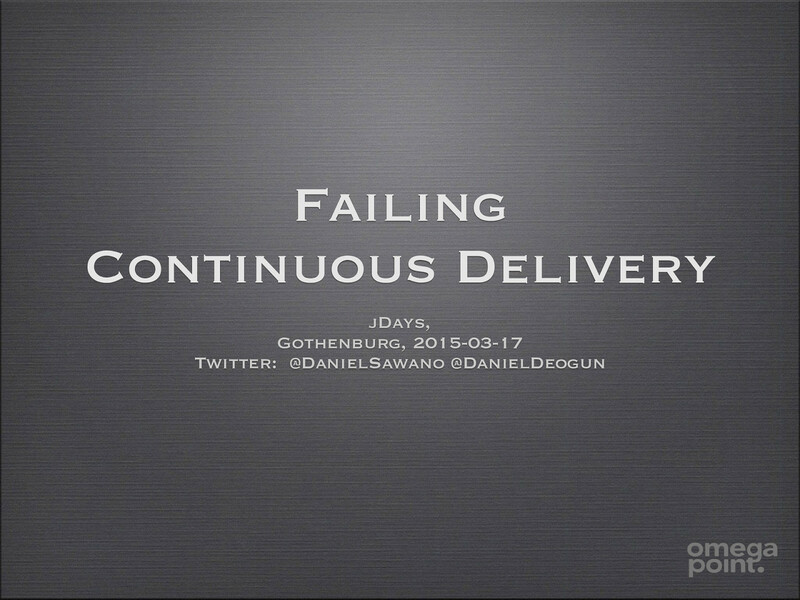 View Failing Continuous Delivery on Notist. This presentation was given by Daniel Deogun and Daniel Sawano at the JDays conference, Gothenburg, 2015. The concepts and techniques on how to implement continuous delivery have been around for quite a while and is moving away from the exclusive club of early adopters. The tooling and technology around CD have evolved and allows us to fairly easy implement delivery pipelines and the necessary infrastructure. But why is it that many organizations still seem to struggle? As it turns out, the technical solutions of CD is not where the challenges lie. Instead, the hard part is to transform business processes and workflows to a mindset of continuously delivering value. It also puts new challenges on the individual to adopt a new view on how to develop software. In this presentation, we will look at common pitfalls and challenges in implementing CD, and share our experiences from the trenches.